Home Newsletters Free Shipping Till Christmas! Free Standard Shipping On ALL ORDERS Until Christmas! As 2016 winds down we’re celebrating two years of Brenpa’s Kitchen and our intrepid experiment in generosity, distributing our Mindful Chili Sauce via the gift economy. In the holiday spirit we’re opening our hearts to practice even more generosity, and will cover the cost of shipping on all orders between now and Christmas! 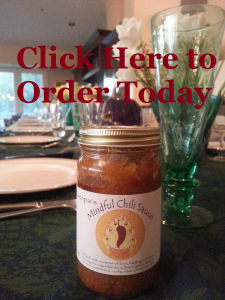 Our Mindful Chili Sauce is a perfect gift to that friend or family member who loves anything Indian, Tibetan, or spicy, who appreciates and supports local made products, or who believes in intention setting. We hope you will help us spread the love and generosity by gifting some Mindful Chili Sauce to your friends and family this holiday season!